I haven’t seen a blossoming potato field in years. Not since I left Maine, where I spent countless hours near or in direct contact with potatoes: dropping the seed pieces into ditches of soft dirt; pulling them from upturned fields into buckets; washing them in a barrel washer, the delicate skins of the early ones peeling like paper and the tough-skinned storage ones always clinging to a little dirt; sorting the gooey rotting ones from the firm, the tiny robin’s-egg ones from the large, and, one year, the dark blighted ones from the few that survived. It’s a little past 9:00pm somewhere outside Mount Vernon, Washington, the end of a hot day. The sky is glowing at the horizon above the lush teenage corn stalks and I’m waiting for my teammate to slap an orange bracelet to my wrist, sending me into four miles of flight. Of dust, bugs, a blue-ing sky filled with orange-pink light silhouetting the little round bird deterrents on the power lines. 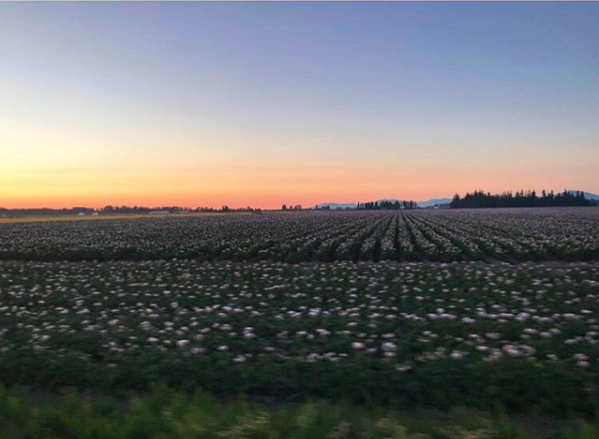 The corn fields stretch far out from both sides of the road, and then it’s the potatoes, perfectly hilled, white blossoms glowing purple in the nightfall. I have no headphones; it’s been at least a year since I’ve run with them. I’m not talking to anyone. It’s quiet except for the vans driving by, the footfalls of a few other runners, some birds cawing into the dying light, and my own breath. I’m really good at breathing when I’m running. I fall into a rhythm that feels slow and methodical, like my body is clicking into a gear it knows, where my lungs and heart sync. 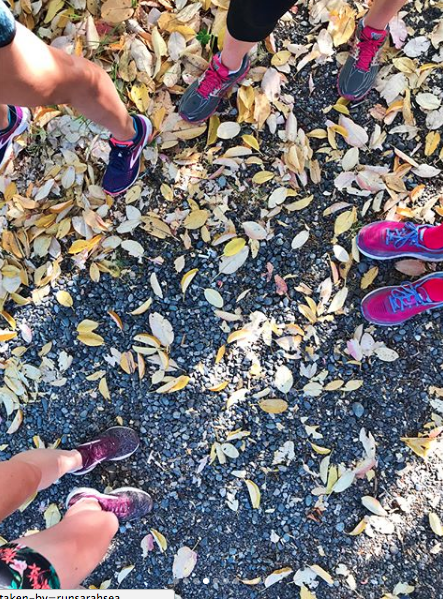 It’s one of the millions of little things that happen on a good run that remind me that despite everything – the pressure of training for a big race, the endless battles with injury, the pain that comes with endurance – I love this sport. I often think that I don’t ever really do anything right. If you asked me, I’d tell you there’s no such thing as “doing things right,” but I still can’t always apply that belief to myself. My work history is highly unusual, which is often a detriment. My time management skills are trash. My goals are flighty and my ambition often poor. My body has been consistently injured for nearly a year. In many ways I can’t help but feel broken, with no clear path before me. Even in that potato field all those years ago, I only looked as far ahead as the next bed. I was young and had all kinds of time. I didn’t have broken bones or nerve damage or tendonitis or sessamoiditis; I wasn’t throwing money at sports doctors, physical therapists, acupuncturists, massage therapists (for the record, I appreciate my massage therapist more than words can say), prescription steroids, supplements, MRIs, approximately 10,000 different foam rollers, toe spacers, and other bizarre gear in a desperate attempt to make this body stop hurting. I do all of it for one reason: I want to run. Maybe only runners will understand. Spelled out like this, all of the work, time, energy and money put into something that on the surface doesn’t look like it's helping me might seem to only exacerbate my general sense of inadequacy. But the sunset potato blossoms tell me a different story. They whisper at me softly, while my breath flows, the only form of meditation I can ever bring myself to do. Even the pain I feel as a result of this run is dissipated by the experience of doing it. The peace of this night, with my team and chosen family nearby, the darkening neon sky, the cool air, my legs turning over, my mind nowhere but a field somewhere in rural Washington state (and maybe a little in a different field too, in a different state, where a piece of me lies buried in the alluvial soil by Merrymeeting Bay) – it fills me, and amid the chaos I am untroubled.